Parenthood. You fear you will never watch a movie again. Yes, there’s the occasional date night where you enter a time machine and go back two years to relive your fun Saturday night hours of 7-11pm. Catching a movie on TV is logistically much easier. That said, I discovered my wife and I also don’t have time to do that either. Our little boy goes to bed close to 8pm. Then it’s time for dinner, schedule coordination, playroom clean up, taking out the garbage, email, and then sleep. I know this is not unusual, but I honestly don’t know where the average family finds the time to watch five hours of TV a day. The math doesn’t add up. The truth is, I’ve got just one opportunity a week to get my wife to sit down with me at home for two hours and watch a movie. Saturday night. And I need to be ready. Another truth is my wife and I fall into gender stereotyping when it comes to movie preference. Yes, I can cross over to watch the newest, saddest movie that’s winning all the awards, but she usually isn’t into explosions and mayhem. So when it’s time to talk about watching a movie, I’ve got to select wisely. Netflix. I rode their PR storm and kept both the DVD and streaming plans. My digital army just isn’t getting it done. Your only chance is to prerecord a flick on the DVR and offer it up as an option. But that takes planning. HBO on demand offers a paltry selection. I cancelled that a year ago. Yes, there’s the HBO Go app, but Cablevision (my cable provider) was slow to ink a deal with HBO. I read a few months ago that it’s coming soon. I have high hopes. Pay per view movies- the screen interface is overwhelming and slow. And I’m not too psyched to pay another $5 on top of an already sizable monthly entertainment investment. A lot has already been written about the paltry selection of good newer movies. Totally agree. You need to stick to older content. My wife is fine with that, but my goal is to catch up on movies that we recently missed in the theater. You’re back to the pay per view model again. But it all goes down a little smoother. The interface is more elegant. And just because it’ s an Apple product, I think your budget-minding neurons get blocked. I bought this economical little hockey puck over the holidays and am just starting to explore its hundreds of channels that you can subscribe to, like Netflix and Amazon Prime. It’s like a streaming video cable box from the wild wild west, and a little overwhelming. I know I said preplanning was a thing of the past, but spending a little time at the computer building a preapproved list of movies in ‘your cue’ is almost bullet proof. You just need passing conversations with the other brain to get the approvals. Yes, this old model also takes some effort, but the cumulative, occasional effort you put towards this will maintain a movie cue that automatically puts a red envelope in your mailbox. No, opening the red envelope is no guarantee to success, but you’ve got a good shot. Time killer. No longer on the radar. Note: You’ll see on the website its trying to reinvent itself. What could possibly be wrong with all of this? Here’s the rub- it takes time to review choice. Time you don’t have. Remember, you’re working with two brains. Different brains. 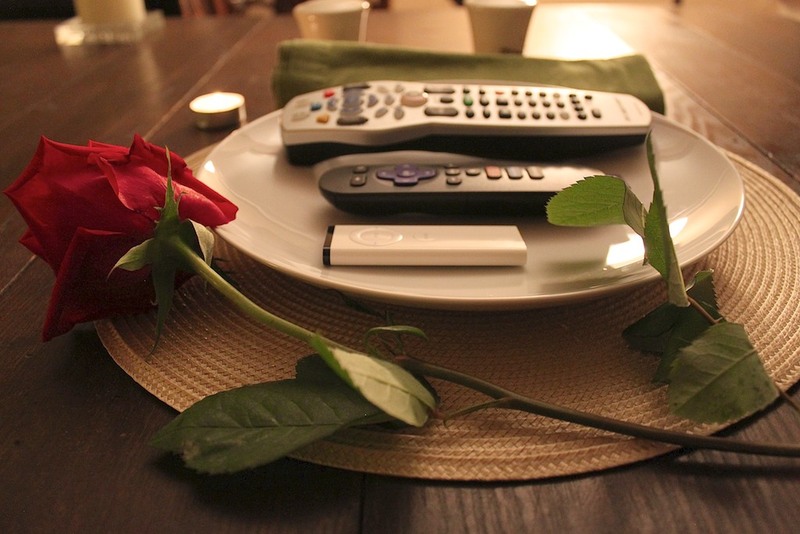 You sit down to dinner on the couch with the remote in hand. If it’s fifteen minutes later, and you haven’t agreed on a flick yet, and most of your meal is already gone, the odds of actually starting a movie go down exponentially. Don’t lose sight of your goal. Bring choice, but not too much choice. And whatever you do, don’t take too long!